For the last several years, the collectors club has been peppering their exclusive twelve inch figure releases with.a sort of expanded universe of Adventure Team era characters. I’ve found the new ideas intriguing, particularly from the standpoint of a small Joe collector who’s not been entirely thrilled of late with the club’s past extensions of the Real American Hero mythos. The MARS Henchman,MARS Trooper and Man of Evil have piqued my interest enough to get me to switch my free figure from the small to large format. As soon as saw the glow in the dark Doctor, I was hooked. 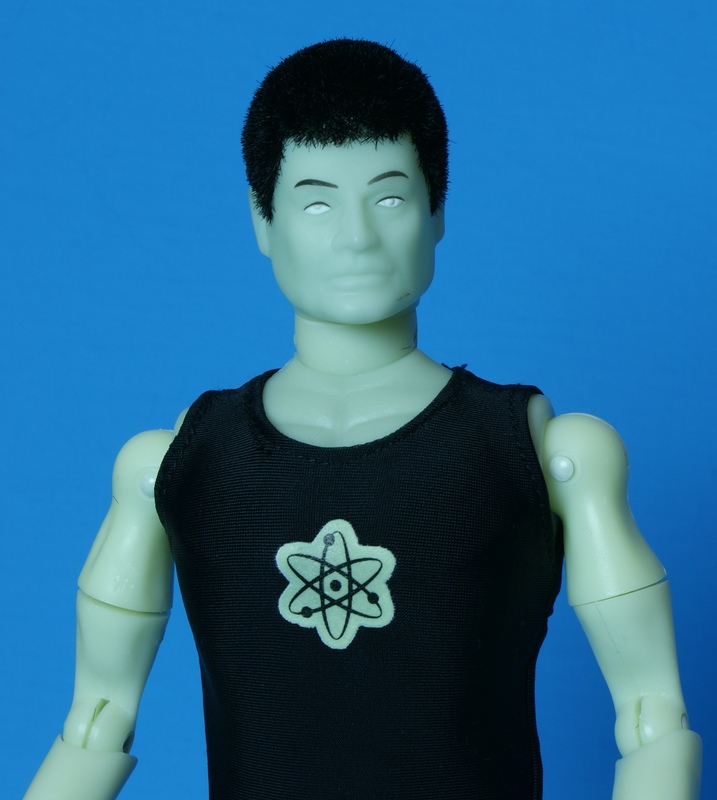 Doctor Isotope is made up of the standard classic GI Joe body, with Kung Fu Grip hands. He’s been given flocked hair, which also fits him in well as an Adventure Team adversary. Initial mock-up photos of the figure depicted the Doctor with a Selleck-esque mustache. This was nixed for the final release. I have to wonder if it was a stylistic or production choice. A flocked ‘stache Joe figure wouls have been pretty darn cool, I think. The main feature here is the glow in the dark plastic, and it works very well. since the head is made of a softer material, the glow is a bit different from the rest of the figure. 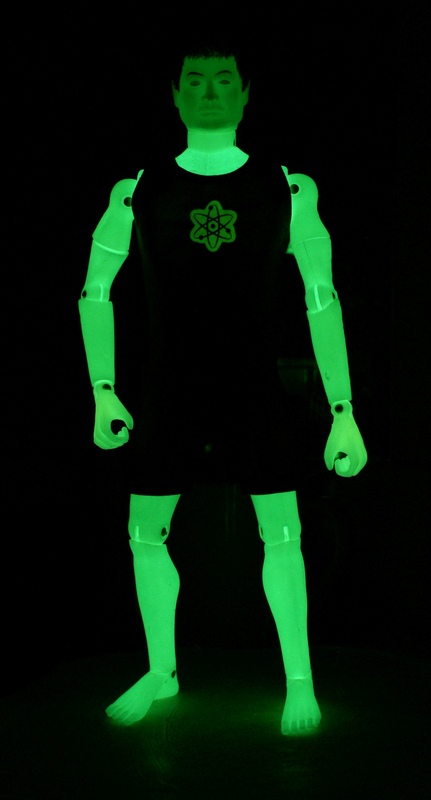 Doctor Isotope came outfitted in a very basic black singlet, with a glow in the dark chest emblem. I was very impressed with the emblem, as it appears to be a heat transfer. The Man of Evil figure from a few years ago was decorated with only a sticker, which easily falls off. Kudos on the upgrade here. 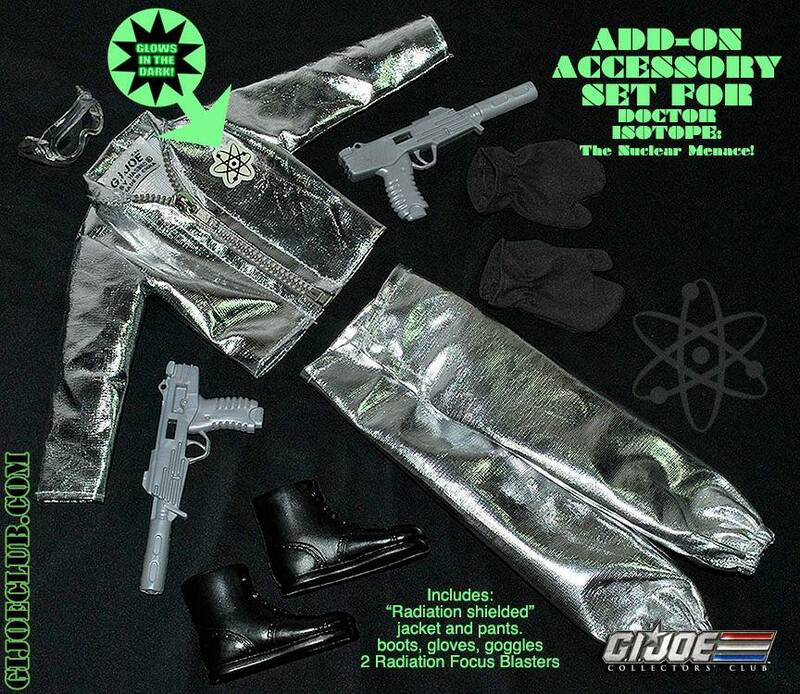 There is an add-on outfit available, which resembles 60s Bond villain attire thanks to its foil appearance, goggles and futuristic pistols. I have yet to pick it up, and though I like the idea, the costume does cover up most of his glow in the dark skin. I’m all for more expansion of the 1970s era, and hopefully the club’s next offering of a twelve inch Super Joe will meet the expectations laid with Atomic Man and the Doctor. Beyond that, maybe the Intruders or Gor could make an appearance. The sky’s the limit–wait, I know–Bullet Man! What a cool figure concept & execution!! I only ever had one 12″ Joe in my collection, but this guy woulda been a great foil to him! I think they should have kept the mustache. Very 70s and reminiscent of Dr Mindbender. And they should have given him a radiation suit like Clean Sweep’s, maybe a yellow version of the Crash Crew firefighter protection suit. Thank you for including the 12″ Joes and Knockoffs on JAD!!! I love reading about the more obscure areas of the greater Joeverse.